Offering this adorable transitional mama doll, circa 1940's-50's, hard plastic head, arms, and legs, cloth body. Her face is so loveable! - large sleep eyes with full lashes - she even has tiny wrinkles under her eyes which gives her such an expression! ; retains her cheek blush, lips look like they may have been repainted at one time, under the lovely honey blonde saran stitched wig (which has wonderful curls) is her molded hair. Still retains mama crier but does not work. Measures 18 inches long, good+ condition, cloth body is good, clean, no holes or stains, has some age darkening as expected. Arms and legs are good+, no cracks, few normal wear marks, still retains blush on knees. Head is good, as stated above, only defect is there is a crack on the back of her neck going up onto the head about 2 inches long, not seen as wig covers it; also there is a tiny hairline crack under her chin at neck base, does not detract from looks. 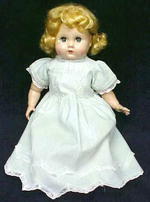 Comes with a pair of white rubber shoes, rayon satin undies, and a pretty mint green dress made of batiste, adorned with ivory lace trimming. A beautiful doll for your collection!